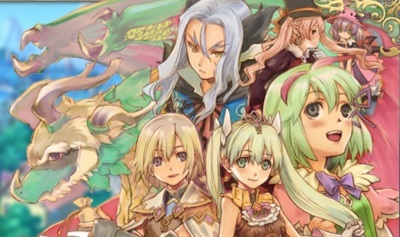 Let’s get one thing straight: Rune Factory games are huge. There is little to no chance anyone on staff can play one of these games quickly enough to do a proper review after a week, given our review guidelines. So, here are my first impressions of Rune Factory 4 after at least ten hours of the way through the game. 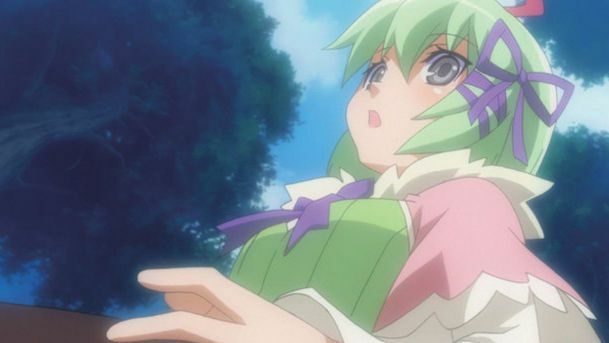 First things first, if you’ve ever played a Rune Factory or Harvest Moon game before, you’ll be familiar with most of the base concepts of the game. You have farming, which hasn’t really changed since the beginning, and you have the adventuring, where you mine, gather resources and fight in the action-RPG side of things. 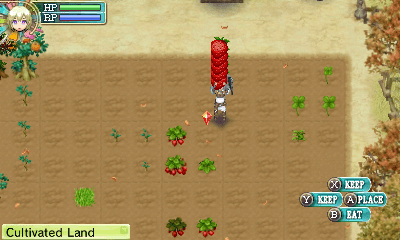 One of the things touted coming into this game was a removal of grid-based farming. I’m not exactly sure what it means but I don’t see much of a difference. You have designated areas where you can farm—which isn’t limited to just your living area—and you till squares that are predetermined. There is a difference in that you have 2×2 squares that have differing soil quality levels. You can check the levels with the Magnifying Glass and create fertilizer from grass in order to raise the soil level. (NOTE: I originally said Greenifier was what improved soil quality. While Greenifier does have uses for the soil, that was inaccurate.) But other than that, not much has changed. The action sections in the game are pretty standard for this series as well. You fight the monsters you come across and gain experience as you fight more. 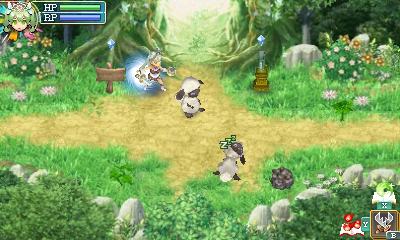 You can also befriend monsters in order to help you fight and work on the farm by brushing them and giving them a gift. I usually go for a combination of brushing and Onigiri (rice ball) in order to befriend monsters. You also travel through caves that feature major boss battles at the end. So far, I’ve defeated one boss and am working on the second. You can also take requests from townsfolk—which is done by talking to either villagers or a talking box called Eliza (cute touch there, Neverland)—which will result in a number of different rewards upon completion. One of the things I like about the requests is that they don’t expect you to do something that you’ve already completed. For instance, if a person asks you to befriend an animal and you’ve already done so, you just simply talk to Eliza again and she (or would being a box make Eliza an it?) will give you the reward. And, of course, you have the other signature of these games: crafting, forging, and cooking. 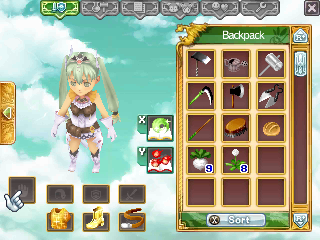 Just like most any other Rune Factory and Harvest Moon game, you need to earn your tools and the recipes to make items, food, weapons, and better tools. However, there is one catch: you can’t get the tools until you earn a license for it. And this is the start of where Rune Factory 4 separates itself from the rest of the series. 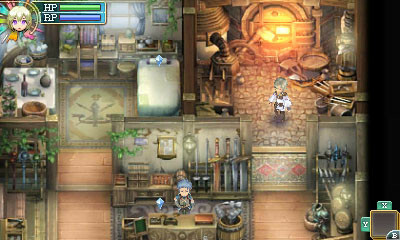 The main plot of Rune Factory 4 deals with your character becoming the Prince/Princess that rules the town of Selphia. As the head of the town, you can dictate what happens via Orders. This can lead to new Festivals, licenses for cooking and crafting, and even a bigger backpack. You execute these Orders by earning Points, which are earned through shipping items, defeating monsters, completing requests, and even simply talking to the townsfolk. This system works very well. Some of the Orders may seem out of reach at first but can be executed rather easily. Every little point really does add up, especially if you keep up with shipping, adventuring, taking requests, and talking with the citizens. I’m about 16 days in and have so far earned nearly all basic licenses, built an animal barn, expanded both my backpack and storage bin, and have created all but one festival that was available to me. Pretty soon, I’ll earn that festival, work on a higher cooking license, and start working on expanding my backpack more. 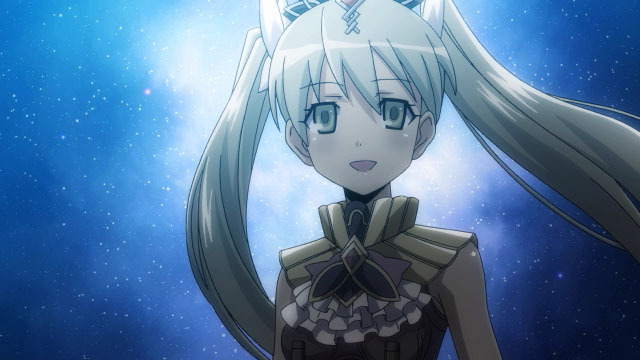 There is only really one thing I don’t like about Rune Factory 4 so far. That would be the in-game clock. It keeps running inside of buildings. This is something that bugs me, especially since I grew up on Harvest Moon games on home consoles. I like to have time stop when I’m inside a building. I want to feel like I don’t have to run around with my head cut off to do anything. One of my last favorite Harvest Moon games, specifically on a handheld, is Island of Happiness, partly because I can take my time inside of a building. I’ve actually returned and traded-in Harvest Moon games because of it. However, after playing through a bit of the game (and having my anxiety under control), I’ve realized that it’s not that bad, especially with fast travel via airship (which you’ll need to earn a license to use). I’ve been able to farm, talk with citizens, complete requests, fish, and go exploring through a dungeon in a single day and still make it back in time to get at least 8 hours of sleep. Still prefer the other system, but I’m feeling a bit better about this. There’s also a couple of interesting things that I found in Rune Factory 4 that need to be called into question. The first is a very minor one for XSEED, the North American publisher. There is a conversation part during the Fishing Frenzy Contest day were my character talks with a group of villagers when Margaret, one of the love interests, suddenly utters a line of Japanese. I don’t know if that was intentional or not but I don’t necessarily blame XSEED for missing it (assuming they missed it). This is a publisher that probably looks over a million Japanese characters per game. They’re bound to miss three or four in a game. I don’t blame them for missing it. I just wanted to bring it to their attention. The second thing was more on the developer, Neverland. After falling into the dragon’s castle (because dragons have those, apparently), you are asked what your name is. After giving your name and having a brief conversation with the dragon, the main butler will call you by the expected royal family member’s name, which you will object to since that isn’t what you said. But you can also input the Royal person’s name, Arthur, and still have the same conversation. This gets weird when your character, if a man, says something like ‘But I’m not Lord Arthur. My name is Arthur.’ There was a missed opportunity here for some funny dialog with the butler, as well as an “I am you, and you are me” conversation with Arthur when he arrives (again, if you choose the male). On the female side, they did make sure to have your character point out that Arthur is a boy’s name. But besides those issues, I’m having a lot of fun with Rune Factory 4. Everything that makes it a Rune Factory game is wonderful and the added Royal duties in the game hit the mark. This is a top notch game worthy of anyone’s money. It may even be my personal Game of the Year. If I were giving Rune Factory 4 a score today, I’d consider giving it the full five stars. However, I think I need a little something more to put it over for a perfect rating. I can’t really put my finger on it right now but I feel like something in the game needs to ‘wow’ me. I hope it’s still in the game waiting for me. If you were on the fence about Rune Factory 4, I hope I convinced you to buy it. But be warned: if you purchase the game through the eShop, you will need at least 11,000 available blocks to download the game. Like I said earlier, Rune Factory games are huge. This copy has been provided by the publisher for review purposes.